Valpo’s College of Engineering develops leaders for tomorrow. The College of Engineering offers students the opportunity to major in several accredited programs: civil, electrical, computer and mechanical engineering along with two new programs, environmental engineering and bioengineering. Students can explore their discipline fully by participating in undergraduate research projects, cross-cultural learning experiences, and a capstone senior design project. 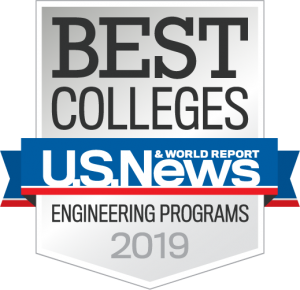 Valpo’s College of Engineering is ranked #18 among bachelor’s and master’s engineering programs nationally from the U.S. News & World Report 2019 Best Colleges.